I was the lucky recipient of a Lavish gift voucher recently, and I think they’re great. Beautifully packaged, and available to spend in more than 300 spas nationwide (including places like The Sanctuary, plus Dove and Elemis spas around the country), these are the ideal gift for those difficult to buy for people who you think deserve a treat. 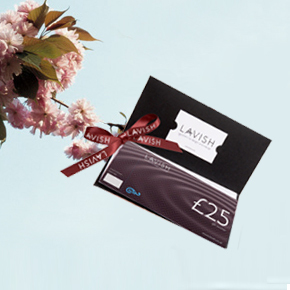 I set up Lavish a couple of years ago as I was frustrated with the quality of gift vouchers on the market for spa and beauty treatments. I found that in most cases if you bought a voucher as a present to celebrate a special occasion or milestone birthday, the vouchers themselves would often arrive not looking very special at all. So I went about developing a new spa & beauty brand that could supply gift vouchers that would feel special and indulgent from the minute the recipient opens their gift. I also wanted to develop a single voucher that could be used for any treatment, one that was as open and flexible as a book token so that for the ‘giver’ there was no danger of giving the wrong treatment or risk insulting someone with a well-meant treatment choice which could be the absolute opposite of what the recipient would actually consider having. Also many of my friends and family live all over the country and so I wanted to develop one single voucher brand that was accepted anywhere in the UK, so that I could be sure the people I was buying a gift for were sure to find somewhere near them to enjoy having a spa or beauty treatment. So the concept of Lavish was born! I worked with a wonderful designer who came up with a brand inspired by the decadent 1920s and some beautiful packaging to make Lavish vouchers a gift that is sure to impress, delight and be adored. Once we had come up with the brand, a website was developed that would serve as a place for gift buyers to purchase Lavish vouchers and also for Lavish voucher recipients to find a salons or spa to spend them in. We now have over 300 gorgeous pampering locations in our portfolio that covers a range of places from sumptuous destination spas, to city day spas, high street salons and mobile therapists. We aim to make taking time out to be pampered an affordable luxury for everyone all over the UK, whatever their lifestyle and to ensure that spending Lavish vouchers is a simple and delightful experience. What a lovely idea. I have been reading this out to MrCeona, with a few added embellishments. I think he may have taken the hint.